Beneath a waterfall on the Franklin, Aljaz Cosini, river guide, lies drowning. Beset by visions at once horrible and fabulous, he relives not just his own life but that of his family and forebears. In the rainforest waters that rush over him he sees those lives stripped of their surface realities, and finds a world where dreaming reasserts its power over thinking. As the river rises, his visions grow more turbulent, and in the flood of his past Aljaz discovers the soul history of his country. 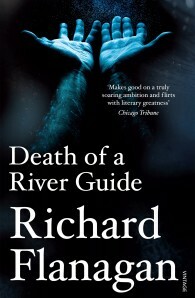 Richard Flanagan’s 1994 debut about a mythical Tasmania dazzled readers around the world, and is now recognised as one of the most powerful and original Australian novels of recent decades. Richard Flanagan was born in Longford, Tasmania, in 1961. His novels, Death of a River Guide, The Sound of One Hand Clapping, Gould's Book of Fish, The Unknown Terrorist, Wanting and The Narrow Road to the Deep North have received numerous honours and are published in twenty-six countries. He directed a feature film version of The Sound of One Hand Clapping. A collection of his essays is published as And What Do You Do, Mr Gable?